Overview: QQ browser HD (aPad) is the most popular flat panel Andrews browser. 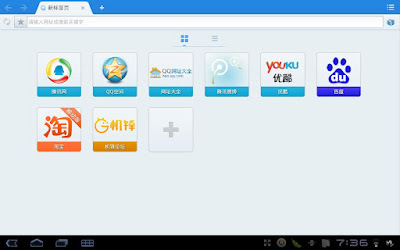 QQ browser HD (aPad) with its smart and powerful functions: multi-tag freely switch, intelligent account Tencent business free landing, navigation fast chain content rich applications songs online correct, fluent and smooth operation, fresh and simple interface, the Web Wap can browse to help you to the Android Pad Internet capabilities to the limit. Your support, QQ browser HD will better serve you! 0 Komentar untuk "QQ Browser HD aPad v1.9.2.90 Apk"